The younger Flynn’s lawyer, Barry Coburn, declined comment. The elder Flynn was fired in February after just 24 days as Trump’s national security adviser when it became public that he misled Vice President Mike Pence and other Trump officials about his conversations with the Russian ambassador to the U.S.
NBC News reported Sunday that federal investigators looking into Russia’s intervention in the 2016 election and possible collusion between Moscow and the Trump campaign have gathered enough evidence to bring charges in the investigation into Flynn. The grand jury is continuing to interview witnesses with knowledge of Flynn’s business activities over the next week, two people familiar with the deliberations said. Erdoğan has repeatedly pressed U.S. officials to extradite the cleric, Fethullah Gülen, who lives in Pennsylvania. Turkey blames Gülen for the attempted coup in that country in July 2016. Erdoğan also has repeatedly raised Zarrab’s case with U.S. officials. Rudy Giuliani, who was a top Trump campaign surrogate alongside Flynn, is part of Zarrab’s defense team. The New York Times reported that Giuliani met with Erdoğan in late February and discussed an agreement under which Zarrab would be freed in exchange for Turkey’s help furthering U.S. interests in the region. Speaking to reporters after the meeting, Erdoğan said he had previously raised Zarrab’s case with then-Vice President Joe Biden and suggested Preet Bharara, the U.S. attorney in Manhattan, was acting on behalf of supporters of Gülen, according to the Turkish newspaper Hürriyet. Trump fired Bharara this past March. The possibility of the multimillion-dollar deal involving Flynn and Turkey arose as investigators examined Flynn’s past dealings with foreign governments. Flynn was paid $530,000 last year during the 2016 campaign for work he did during the campaign that the Justice Department says benefited the Turkish government. Flynn did not register as a foreign agent at the time, as is required in the U.S. for anyone working for a foreign government. His lawyer later said Flynn didn’t need to register because his client was a Turkish businessman not a government official, though he opted to do so retroactively. According to Flynn’s Justice Department filing, his firm, Flynn Intel Group, was hired to gather information about Gülen, and to produce a short film about its findings. As a top foreign policy adviser on the Trump campaign at the time, and then as national security adviser, Flynn played a leading role in shaping Trump’s policy decisions on Turkey. Among Flynn’s decisions as incoming national security adviser was telling the outgoing national security adviser, Susan Rice, not to move forward with a plan President Barack Obama approved to arm Syrian Kurds in the ISIS fight. Turkey opposed the plan. Obama officials, who had notified Flynn of the plan in early January because it would continue on Trump’s watch, said they were surprised. Flynn said he didn’t trust Obama on the plan, which the Trump administration approved after he was fired as national security adviser. The decision on arming the Kurds came several weeks after Flynn held that key meeting with Turkish officials where the alleged deal for a “grab fee” for Gülen was discussed. It’s been a relatively quiet period for the Trump-Russia investigation since news of its first indictments dropped in late October — but a series of recent reports could give some clues about what special counsel Robert Mueller might do next. First, reports have indicated that President Trump’s former national security adviser Michael Flynn may at least be exploring the possibility of making a deal with Mueller’s team. The question of whether Flynn flips and gives Mueller incriminating information about other Trump officials or the president himself could turn out to be tremendously important. Second, Mueller’s investigators have already interviewed several top current and former White House aides, and they plan to interview several more in the coming weeks, including White House counsel Don McGahn, communications director Hope Hicks, and a communications aide who’s worked closely with Jared Kushner. Third, we learned this week that Turkish gold trader Reza Zarrab, who had been charged with orchestrating a scheme to avoid Iran sanctions, has agreed to become a government witness as part of a plea deal. And while Zarrab’s prosecution is separate from Mueller’s probe, his name has intriguingly come up in recent reports about Flynn’s connections to the Turkish government. With charges against Paul Manafort and Rick Gates filed — their trial is expected to begin in May 2018 — attention has turned to the other Trump associate who’s appeared to be in very serious legal jeopardy: Michael Flynn. Flynn has reportedly been under investigative scrutiny for a plethora of matters — ranging from whether he made false statements about his contacts with the Russian ambassador during the transition to whether he properly disclosed payments he received from Russian and Turkish interests to the broader matter of whether the Trump campaign colluded with Russia. NBC News reported back on November 5 that, per “multiple sources familiar with the investigation,” Mueller had enough evidence to bring charges in the Flynn investigation — and that those charges could implicate Flynn’s son Michael Flynn Jr. of wrongdoing as well. Then last week, the New York Times reported that Flynn’s lawyers had informed President Trump’s legal team that they could no longer share information about Mueller’s case. This was interpreted as a sign that Flynn’s team was exploring making a plea deal, in which he’d provide information in return for leniency in charging or sentencing (either for himself or for his son). The most recent development is that on Monday morning, Flynn’s attorney Robert Kelner met with Mueller’s team, according to ABC News. It’s still not entirely confirmed that they’re discussing a cooperation deal, but it appears to be a strong possibility. Whether they’ll arrive at such a deal and what it might entail remains unclear. Don Emmert/AFP/Getty But Mueller’s team isn’t only investigating what happened during the campaign. They’re also looking into whether President Trump attempted to obstruct justice once in office — and they’re asking White House staffers to give sworn statements about what they might know. White House senior adviser Stephen Miller — who is very close to both Trump and Attorney General Jeff Sessions — was recently interviewed by Mueller’s team, CNN reported. Former White House aides Reince Priebus and Sean Spicer were both questioned in October. At these sessions, aides were reportedly questioned about Trump’s firing of FBI Director James Comey earlier this year, and about the White House’s response to Russia-related news stories. Now at least three other aides are reportedly next on the docket for questioning: communications director Hope Hicks, White House counsel Don McGahn, and communications aide Josh Raffel. Hicks has been part of Trump’s inner circle since he launched his campaign and could have useful information about a host of matters, both from before the election and now. McGahn, meanwhile, will probably be asked about just what he did after he was told that Flynn had been giving false information about his contacts with Russians, as well as other matters. But Mueller’s interest in interviewing Raffel, an aide with a much lower profile, is particularly interesting. That’s because Raffel is best known for working closely with Jared Kushner — which could suggest that Mueller is closely scrutinizing Kushner’s activities. 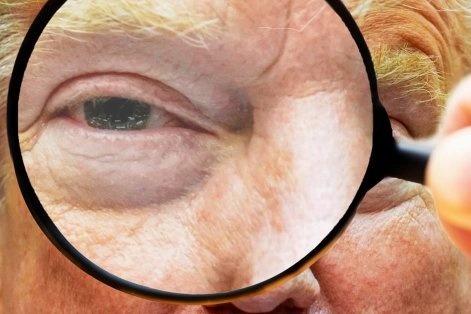 Ozan Kose/AFP/Getty Finally, there’s been a major new development in a news story that’s a bit far afield from Mueller’s investigation — but that could turn out to be related to it. This is the separate case of Reza Zarrab, an extremely wealthy 34-year-old gold trader who has dual Turkish-Iranian citizenship and close ties to Turkish President Recep Tayyip Erdogan’s inner circle. Federal prosecutors indicted Zarrab in 2016 for what they alleged was his participation in a massive scheme to evade US sanctions on Iran by shipping gold to the country in exchange for oil and natural gas. Prosecutors also allege that high-ranking Turkish government officials were involved and took millions of dollars worth of bribes. Nine people were eventually indicted, but only two — Zarrab and banker Mehmet Hakan Atilla — were ever in US custody. It’s long been clear that Erdogan really, really did not want Zarrab’s prosecution to go forward — and he’s waged what the Washington Post’s David Ignatius called an “extraordinary” campaign to try to stop it. This included public denunciations of the charges as a plot against his regime, private lobbying of Presidents Obama and Trump (and other administration officials) to try to get Zarrab released, and an unusual meeting in Turkey with Rudy Giuliani (who’d joined Zarrab’s legal team earlier this year). The obvious explanation, of course, is that Erdogan fears Zarrab could implicate his own close associates or family members. The Turkish president’s effort to get Zarrab off the hook, it’s now clear, has failed. Zarrab has become a cooperating witness for the US government as part of a plea deal, a prosecutor confirmed in court Tuesday. He is expected to take the stand on Wednesday as the case moves forward. What could tie this matter to Mueller’s probe, though, is a potential connection to Michael Flynn. Flynn has already admitted that he was paid by Turkish interests while advising Trump during the presidential campaign. But recent reports have suggested that Mueller’s team is examining whether Flynn continued to act on Turkey’s behalf during the transition, when he was the national security adviser-in-waiting, and during his brief stint in the White House before his firing in February — and whether he may have been promised millions of dollars in return. A meeting Flynn had with Turkish officials in mid-December 2016 has come under particular investigative scrutiny. 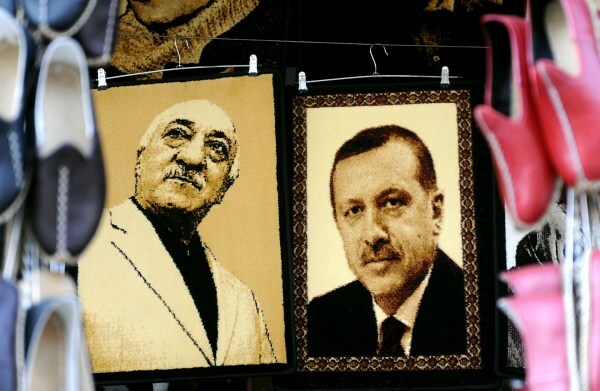 That was the meeting where participants may have discussed a potential deal to deliver Fethullah Gülen, a Turkish cleric opposed to the regime who lives in the US, into Turkish custody, according to the Wall Street Journal. We don’t yet know whether Flynn did anything untoward here, or whether Zarrab would even know about it if he did. Still, Zarrab’s testimony this week will surely be closely watched — by both Erdogan’s government and the Trump administration. North Korea said Wednesday that it had successfully tested its Hwasong-15, a newly developed ICBM that it said could deliver heavy nuclear warheads anywhere in the continental United States. The country called the new missile its “most powerful” ICBM, saying it “meets the goal of the completion of the rocket weaponry system” North Korea has been developing for decades. North Korea’s leader, Kim Jong-un, watched the launch, a broadcaster said, reading a prepared statement on the North’s Central Television. Experts said this latest launch — which landed west of the northern end of Honshu, Japan’s largest island — exhibited characteristics that underscored the increasing sophistication of North Korea’s program. The missile flew higher and for a longer duration than two previous intercontinental ballistic missile launches, which flew for 37 minutes on July 4 and for 47 minutes on July 28. David Wright, a scientist at the Union of Concerned Scientists, said the missile performed better than the two fired in July, and exhibited a potential range of more than 8,000 miles, able to reach Washington or any other part of the continental United States. However, Dr. Wright noted that in an effort to increase the vehicle’s range, the North Koreans might have fitted it with a mock payload that weighed little or next to nothing. So the distance traveled, while impressive, does not necessarily translate into a working intercontinental ballistic missile that could deliver a thermonuclear warhead. For all the evidence of technical advancements, a senior White House official said the significance of the launch should not be overstated, given the number of missile tests North Korea has carried out this year. The White House had expected some form of retaliation after it put the North back on its list of state sponsors of terrorism last week. The launch came in the middle of the night on the peninsula, with less advance warning, according to experts. Aerial photographs of North Korean launch sites did not show missiles waiting on launchpads to be fueled, although Japanese officials had reported that radio telemetry pointed to a possible launch. Some experts theorized that North Korea was now fueling missiles horizontally, before they are placed on the launchpad. 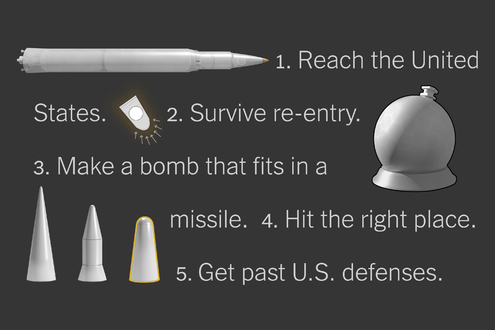 In the past, it went through a lengthier process of rolling a missile onto a launchpad, filling it with liquid fuel and then launching it — steps that could take days. “This shortens the time from when they become visible to when they go in the air, and makes it less likely that the U.S. will be able to strike before it launches,” said Rodger Baker, a vice president of strategic analysis with Stratfor, a geopolitical risk analysis company. American officials offered no proof of the horizontal fueling theory, but they acknowledged that North Korea is searching for ways to get around the United States’ ability to mount a pre-emptive strike. Although it was the third time that the South had fired missiles in response to a North Korean missile test, this response was more muscular, officials said, with South Korea firing from a land-based missile battery, a Navy destroyer and an F-16 fighter jet. It was meant to show that the South had multiple ways of hitting a North Korean missile on the launchpad in a pre-emptive strike, according to South Korean military officials. After the launch, the United Nations Security Council scheduled an emergency meeting on the issue for Wednesday afternoon. President Moon Jae-in of South Korea and Prime Minister Shinzo Abe of Japan each called meetings of their national security councils to discuss the North’s latest provocation. Mr. Trump called both leaders on Tuesday, at their request, according to the White House. Unlike the launches over the summer, when the missiles flew over Japan’s northern island, Hokkaido, the government did not issue cellphone alerts to warn its citizens. Mr. Trump, who has in the past insulted Mr. Kim and threatened “fire and fury” that would “totally destroy” that country, avoided threats of military retaliation against the North on Tuesday. But he did not hesitate to use the specter of a military confrontation in Asia as leverage against the Democrats in the budget wars in Washington. The missile launch, he predicted, would “have a huge effect on Schumer and Pelosi,” referring to Senator Chuck Schumer of New York and Representative Nancy Pelosi of California, the chambers’ Democratic leaders, both of whom boycotted his budget meeting. North Korea has persisted in its nuclear weapons and missile development despite nine rounds of sanctions that the Security Council has imposed since its first nuclear test in 2006. This year, the North has increased the frequency and daring of its missile tests, sending two missiles over Japan in August and September, while demonstrating technical progress that suggested it had developed the ability to strike the continental United States. In the wake of a Sept. 3 underground nuclear test — the sixth by North Korea — the United Nations Security Council imposed a new round of sanctions against the country. In the nearly three months since that test, as leaders of North Korea and the United States have exchanged insults, the world has braced for another show of force by the North. Mr. Kim responded by calling Mr. Trump “a mentally deranged U.S. dotard,” and his foreign minister later warned that Mr. Kim could order the test of a hydrogen bomb over the Pacific. mikenova shared this story from Mike Flynn – Google News. Has Mike Flynn Already Flipped on Trump? Mueller homes in on Michael Flynn: How much did Trump know? WASHINGTON — Former national security adviser Michael Flynn appears to be under investigation for his activities while he ran the Defense Intelligence Agency during the Obama administration, according to a letter the agency sent to BuzzFeed News. The disclosure suggests that special counsel Robert Mueller is looking more broadly than previously thought at Flynn, whom President Donald Trump fired in February after 24 days as his top security adviser. Mueller’s investigation previously has been reported to include a probe of Flynn’s activities after he was ousted from the DIA in 2014 and traveled to Russia, lobbied for the Turkish government, and joined Trump’s presidential campaign. Until now, however, there has been no indication that Mueller was looking into Flynn’s two-year tenure as head of the nation’s leading producer of foreign military intelligence. Legal experts said the letter is the first public indication that Mueller is investigating Flynn’s stormy leadership period at the DIA, which ended when he was forced to retire earlier than planned amidst criticism over his leadership. “It certainly suggests that Flynn is being investigated not just for conduct that postdated his departure” from the DIA, said University of Texas law professor Stephen Vladeck. Flynn’s lawyer, Robert Kelner, did not respond to a request for comment. A spokesperson for Mueller declined to comment. It is unclear what Mueller might be investigating about Flynn when he ran the DIA. Although Flynn was reported to have been forced out after clashing with other Defense Department leaders, there has been no public indication of scandal or criminal activity during his 33-year military career. He retired as an Army lieutenant general. Mueller might simply be casting a wide net, said Jens David Ohlin, a criminal law professor at Cornell Law School. “You could imagine a scenario where Mueller’s team is doing their due diligence and wants all his emails during this period because they’re investigating his relations with Russia and Turkey,” Ohlin said. Or Mueller could be looking into any possible conspiracy involving Flynn that may have started years ago, Ohlin said. In 2015, more than a year after he left the DIA and shortly before he joined the Trump campaign, Flynn was paid $33,000 to speak at a gala in Moscow where he sat next to Russian President Vladimir Putin. In 2016, after joining the Trump campaign, Flynn was paid $530,000 by a Turkish businessperson for advocacy work in the US on behalf of the Turkish Republic. Flynn’s initial failure to disclose his work has exposed him to possible criminal charges similar to those Mueller has brought against former Trump campaign chair Paul Manafort. During the transition period after Trump’s election, Flynn spoke several times with Russia’s US ambassador but lied about those exchanges to the FBI and to Vice President Mike Pence. Trump fired Flynn when Flynn’s misleading of Pence became public. The DIA sent its denial letter to BuzzFeed News at roughly the same time that Flynn’s lawyers told Trump’s legal team that they would no longer share information about Mueller’s investigation into Russian meddling in the 2016 election and possible coordination with Trump associates. The notification by Flynn’s lawyers suggests that Flynn is cooperating with Mueller as he investigates whether the Trump campaign coordinated with Russia’s efforts to undermine Hillary Clinton. Leopold, the reporter, had requested records pertaining to Flynn on May 1, 2014, while Flynn was still in charge of the DIA but a day after the Washington Post reported that he was being forced to retire because of his management style and resistance within the agency to his plans for change. In denying Leopold’s request, the DIA said its refusal is not necessarily “long-term” and that it will “reassess future requests” for records pertaining to Flynn “at the conclusion of the present investigative activity.” There was no immediate explanation for the delay in responding Leopold’s request. DIA spokesperson Navy Cmdr. William Marks said he did not know how long the investigation would take. “Some investigations take years, some only take a few weeks,” he said. Flynn, a retired U.S. Army lieutenant general and former DIA director, is currently under investigation by Special Counsel Robert Mueller and congressional committees. They are scrutinizing his private consulting work for a Turkish businessman as well as his activities related to Russia during President Donald Trump’s campaign and the early days of the Trump administration. The Defense Department’s inspector general also is investigating Flynn’s receipt of foreign payments as a retired military officer. In a series of letters dated Nov. 15, the DIA denied several Freedom of Information Act requests filed over the past year by The Associated Press seeking information about Flynn’s tenure at the DIA from 2012 to 2014. The AP requests sought Flynn’s public and private calendars, his correspondence while at DIA and a specific listing of documents related to his security clearance that the agency provided to Congress earlier this year. Two of the AP’s requests were filed before Mueller’s appointment and one of those was filed the day before Trump took office. In the letters, Alesia Y. Williams, DIA’s chief FOIA officer, said she would not release any requested records because they “could reasonably be expected to interfere with on-going law enforcement investigative activities.” Williams also indicated this was part of a coordinated effort within the Defense Department to withhold public documents related to Flynn that could be related to ongoing federal and congressional probes. BuzzFeed News also reported Tuesday that it had received a similar denial for records related to Flynn. The BuzzFeed request was nearly three years old. Messages left with DIA spokesmen Tuesday afternoon weren’t immediately returned. The agency’s decisions came about a week before Flynn’s lawyers informed Trump’s legal team that they would no longer share information about Mueller’s investigation — a sign that Flynn is moving to cooperate or possibly negotiate a deal with prosecutors. Flynn’s attorney, Robert Kelner, has declined to comment on the status of the investigation or the move to cut off contact with the president’s legal team. It’s unclear how long the Defense Intelligence Agency will continue to bar public access to Flynn-related documents, according to the letters. Flynn faces a number of legal troubles on multiple fronts. The special counsel and congressional committees have been scrutinizing Flynn’s contacts with Russia during the presidential transition and the campaign. He has also been under federal investigation for nearly a year over lobbying and investigative research work his firm, Flynn Intel Group, performed for a Turkish businessman. Flynn’s firm was paid $530,000 for a lobbying effort that sought to gather information that could support a criminal case against a Turkish cleric living in the U.S. Flynn also wrote an op-ed promoting Turkish government talking points attacking the cleric, Fethullah Gulen. After his forced resignation from his White House post, Flynn and his firm registered with the Justice Department as a foreign agent, acknowledging his work could have benefited the government of Turkey and should have been disclosed to the government. But since that registration, prosecutors and FBI agents working for Mueller have been investigating whether the Turkish government was directing the lobbying work and not the private company that Flynn cited in his filing with the Justice Department. Investigators have also been looking into Flynn’s son, Michael Flynn Jr., who worked alongside his father, and Flynn’s business partner, Bijan Kian. Flynn has also faced scrutiny over his truthfulness on government forms and in interviews with federal investigators. Former FBI Director James Comey testified earlier this year that Flynn was the target of a federal investigation into his contacts with Russia and whether he lied to agents about his conversations with Sergey Kislyak, Russia’s ambassador to the U.S. In his testimony before the Senate intelligence committee, Comey said it was that investigation into Flynn that Trump pressured him to “let go” in the Oval office. Through his lawyers, the president has denied pressuring Comey. Separately, congressional Democrats have said they believe Flynn lied about his foreign contacts and travel on his security clearance paperwork related to a proposal to build nuclear power plants in the Middle East. The former Republican chairman and the top Democrat on a House oversight committee have also said they believe Flynn broke federal law by not getting government permission to receive tens of thousands of dollars in payments from RT, the Russian state-sponsored television network. The receipt of those foreign payments is currently under scrutiny by the Defense Department’s inspector general, though he would likely only face civil penalties if investigators found Flynn had violated the law. Former White House national security adviser Michael Flynnmay be under investigation for his activities during his tenure at the Defense Intelligence Agency (DIA) under former President Obama, according to a letter from the agency sent to BuzzFeed News. “Upon review of your request, I have determined that the release of potentially responsive records concerning LTG Flynn could reasonably be expected to interfere with on-going law enforcement investigative activities,” it reads. Special counsel Robert Mueller, who is conducting the criminal investigation into Russia’s role in the 2016 election, has previously been reported to be looking into Flynn’s activities since leaving the DIA in 2014. In particular, he is probing Flynn’s financial ties to Russia and Turkey. But according to BuzzFeed, the DIA’s letter denying the records request suggests that Mueller is also looking into Flynn’s activities while he served as the agency’s director from 2012 to 2014. The letter does not detail any potential investigative activities. But federal agencies are allowed to withhold requested documents from the public if they are compiled for law enforcement purposes. “It certainly suggests that Flynn is being investigated not just for conduct that postdated his departure [from the DIA],” Stephen Vladeck, a law professor at the University of Texas, told BuzzFeed. Flynn has emerged as a central figure in Mueller’s investigation into Russian election meddling. He resigned from his White House post in February – just 24 days into office – after it was revealed that he misled White House officials about his conversations with then-Russian Ambassador Sergey Kislyak in the month before President Trump took office. Since then, Flynn has faced scrutiny for his failure to previously disclose his financial ties to Russia and Turkey. He registered as a foreign agent with the Justice Department in March. Reports last week suggested that Flynn may be cooperating with Mueller in his investigation, after his lawyers cut ties with attorneys representing Trump in the Russia probe. The prevailing interpretation of Donald Trump, shared by all his enemies and many of his allies, is that he is a con man. It is a theory that explains both his career in business and politics, and has carried through his many reversals of position and acts of fraud against customers and contractors. It remains quite plausible. But new reporting has opened up a second possibility: The president has lost all touch with reality. The Washington Post and New York Times have accounts from insiders suggesting Trump habitually insists upon the impossible in private. He does not merely tell lies in order to gull the public, or to manipulate allies. He tells lies in private that he has no reason to tell. He still questions the authenticity of Barack Obama’s birth, despite the birth certificate. He insists voter fraud may have denied him a popular vote triumph. He tells people Robert Mueller will wrap up his investigation, with a total vindication of the president, by the end of the year. If Trump actually has the ability to convince himself of his own lies, it would suggest a possibility far more dangerous than even his critics have previously assumed. He might be in the grip of a mental health issue, or at least one more serious than mere sociopathy. And the mutterings that he might need to be removed from office through the 25th Amendment could grow more serious than many of us expected.